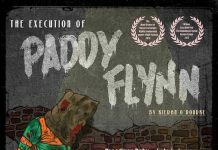 Here is the second part of the extended interview done by Domingos Coxi with the team behind “The Execution of Paddy Flynn”. Sam- We spent days pulling Kieron’s script apart and pulling out each individual character’s journey then spent 2 weeks working on relationships, forget it’s funny for a second and lets play it like it’s real. Domingos-What I’ve noticed as well is you seem to have tapped into though in a theatre playground, the traditional British sense of humour. Going back to a bit of the Monty Python style of humour? Kieron –Daft, Suggests an element that it’s just silly but ridiculous. They keep digging the hole deeper, this only works because (the characters) they are desperate. It also has through the jockey (Paddy Flynn) that Irish sense of humour, Irish wit being pitted against the working class, Sheffield, northern humour. 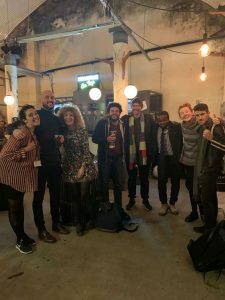 Domingos- I like the fact that the play was set in Sheffield, and the actors are from the regions, it gives the play a different perspective and authenticity. Leonora– W e have seen a lot of plays performed in Sheffield, they often are auditioned down in London, then taken back to Sheffield, so it’s tough. Domingos– How did you organise all of it? Leonora– We Advertised on Mandy.com (a site where professional crews and cast can be hired) then in between us, we all decided what the specifications was, age limits we went through the script, we put it on for a set amount of days, , it was just a matter of call backs. We gave them (the actors) sides parts of the play we wanted to hear, and then auditioned them. Leonora-It was nice to see the amount of people that did come, we didn’t meet anyone that was rude or obnoxious, it was a nice turnover. Sam-We asked people to bring what they were already comfortable with; we wanted to see people who enjoyed storytelling, so we were inspired and excited. We ended up seeing 30 odd people who absolutely nailed their auditions; it made our job incredibly difficult. Domingos-So you were very flexible? Leonora– We struggled with the height of the Jockey as well; we got a lot of 6-foot people. I know when I’ve auditioned you just send it in. Sam-We had one actor audition who was excellent, he questioned whether George Mooney was an Irish name? Mooney has Irish heritage, but as it is in Sheffield, it was something we did not consider. Sam-You are always learning in the rehearsal process, you give them the blueprint and the script, they give you back their interpretation, we all have our individual roles to play. Domingos-How do you find the difference in a feature/short film you was doing compared to the theatre production you are doing now? What are the subtle differences and similarities? Leonora-As I just worked on production on a film, for example the horror film we just did (Redcon 1). That was very separate there is maybe a production team of seven of you, you’re given orders passed down from the AD-Assistant Director, you got to work with the extras, and there is many different things, but there is much to do. Sam and me went and got costumes together as we do not have a costume department, its more separate I find it (Theatre) more emotional and Film more maybe business like. Sam-In terms of art forms, theatre can only live in the present tense. In a film, we can show you flash backs, we can do a long shot we can’t do any of that in theatre, all we can do is share how we are feeling now. When you work in film you don’t have to work chronologically. Leonora-Going back to what you said about the person or the characters, we have all acted it’s about living in the present and the adrenaline feeds back from the audience and you are living from that, and that’s how the play will be taken from how the audience each night, will interpret it, the performance will change by the end of the week or by Saturday it won’t be the same as it was on Wednesday, in film its set. Sam-In film you get one role which you don’t in theatre, which is crucial? Which is the role of the editor; you could have two actors give two completely different performances and with the right editor, they could splice them together to be in the same film, and you do not get that in theatre. Sam-You have to listen in a way you don’t necessarily, I don’t mean to diminish some actors, but you don’t have to listen in the same way because it can be reworked in the cut and do retakes. In theatre it’s live and in the present. Domingos-It is fascinating how you said there’s no hiding place, obviously theatre I believe is the lifeblood of performing its grassroots and you are live with the audience. There is no coincidence that whether it’s in theatre or film, different mediums, British performers are doing really well. Because they come from that theatre background, is it because they have that background, all of you have come from that background (Leonora, Sam and Kieron) is it because they have that pure training? Which makes it easier for them to adapt to different mediums? More so then others. Leonora– I was always told that it is easier to go from theatre to film, then film to theatre. Because in the sense of theatre and this is from a purely actors perspective, you can always bring it down, but it’s very hard to go up, so if you’ve had the training its very disciplined theatre, cause you have to because if you miss a beat; you can’t reshoot that you’re done you could even potentially ruin the play, you miss a line. The pressure is on, but that is what you live off, like comedians it’s the feedback, so you train yourself in a way where you can adapt. I mean the British are more traditionally known for training in theatre. A casting director told me that in America, it can be slightly different; I think you can be adaptable. Kieron-When I was in acting school at E15, it was definitely geared towards we are going to make you a good actor, cause those things apply to theatre. There are techniques you learn for screen acting and techniques you learn for stage acting, just kind of technical things like projecting your voice on stage, but on camera, you need to be very aware where the microphone is because you don’t want to be shouting. They need to be aware of the shot on your body, because a small movement on camera can look huge if it takes up most of the frame, where the same movement on stage may not get noticed by somebody who is sitting 100 rows back. The two disciplines are massively different technically, but what remains the same in both is that people have to believe what you are doing, if you can do that on stage in front of loads of people in one go? Then you can certainly do it in a studio in front of a camera operator when you have 10 go’ s. I agree with Leonora, if you can do stage acting, you can learn the technique to do film acting. Sam-T o put it back in the British context, whether I was back in training? We focused on Shakespeare really well, and tell a story in a language that didn’t make any sense, then you could adapt that to all modern day principles. I think the landscape is changing because we are fighting to really hard o make sure, we are not seeing the same faces. That whole hollywoodism is kind of disappearing. Massive playwrights ‘that aren’t contemporary British, are starting to pop up around London. In 5 years it will change again, its a really exciting time for theatre now. Domingos –That’s what I find refreshing about it from a different point of view. Kieron –That style of writing lends itself to the recession, you can’t necessarily afford to put it in a big theatre, people make plays where they tell a story about something they know about., an experience that they got. They are telling you about their lives, theatre and a lot of good storytelling is drama, is conflict, so the most interesting stories from somebody struggling. I don’t need to sit in the theatre and watch a 40 year old white guy telling me about how his stocks and shares aren’t doing so good. But I might be interested in the young female migrant from Somalia about how she was growing up in Brixton I’m just pulling this out of the air hypothetically. How many working class people do you think went to watch those plays? Leonora-Educating Rita with Julie Walters very rarely was it cast with a scouse actress. Sometimes you’d get the back-handed silly female joke like why have you left the kitchen. Domingos-It’s about looking past the layers right? Vault festival is very vibrant and different to what you associate with theatre. Sam-You look at the programme and there is genuinely something for everyone. Domingos-So what 3 words would you use to describe the Execution of Paddy Flynn? To get people to come in and watch this funny, vibrant dark play just 3 words? No pressure I’m going to start with you Leonora. Leonora– Authentic, funny and mischievous. Domingos– I just want to say thank you, Kieron, Sam and Leonora for speaking to us for the Hollywood News Source. I think young British talent in the theatre world is the lifeblood and should be encouraged and I like the fact you are bringing a different perspective, a different prerogative to the medium and I am looking forward to seeing it. You have put your heart and soul into this and care about it; I appreciate you guys giving your passion, knowledge and bring in the northern charm. Leonora-Have a Guinness while you watch it if you drink (everybody giggles). 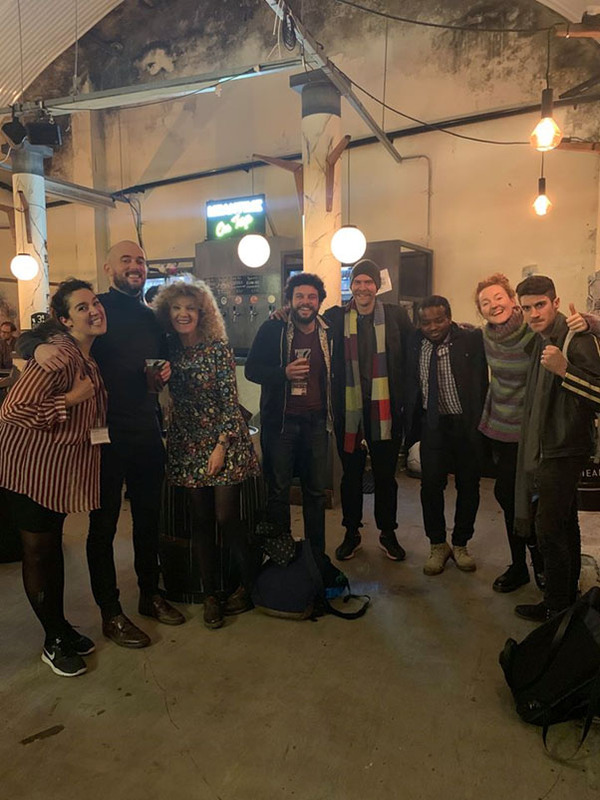 The show ran from March 13th and ended on March 17th St Patrick’s day, the final day of the entire Vault Festival o a sell out show, I had the pleasure of watching the play, it was a great combination of dark and intense moments balanced with dark humour to lighten the story. Follow the team behind the play and cast at Rusted Dust on their Facebook and Twitter.